The blog got its start on September 25, 2010. There were 32 posts added this past year. Total post count is 114. The image shows reader activity by post for the Past 30 days and for All time. Compare with last year's list. It's nice to see that some 2013 posts made it to the All time list and that there is not much overlap between the two lists. Of late, some 2011 posts seem to be of interest. 12/15/2018 -- Added in link to recaps from the beginning. 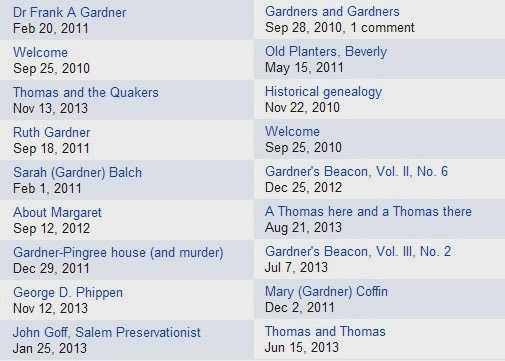 Two days ago, December 29th, was the passing date of Thomas Gardner of Salem. We need to have a yearly reminder set up for that day. Thomas and Margaret had nine children who grew up in Salem, MA. The early boys were born in England. 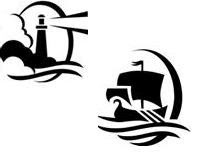 John was born on Cape Ann in a pre-Conant and pre-Endicott Massachusetts. All the children survived Thomas, except for Miriam who died early leaving young children. After Thomas' death, several of his children left Salem. Richard and John went to Nantucket. George became a citizen of Connecticut though he continued to own land in Massachusetts. Thomas' last wife, Damaris, and her children were active Quakers. The Puritans did not like that belief system and responded with a heavy hand even though Charles II told the New England authorities to refrain from their persecution. Thomas' step-son, Samuel Shattuck, carried Charles II's message to Endicott who stayed his hand from awhile. Unfortunately, Samuel's missive was too late for Mary Dyer and others. We have only touched the surface here, only to the extent to start to see the Gardner involvement and influence. Expect that the topic will appear again. We continue our "Annals" ways with this issue. It can be nice to see a timeline related to events. Also, we have a short list of Thomas' and Margaret's first-born grandchildren. We have two listed for Seeth since her first husband died young, during Thomas' life. See Vol. III, No. 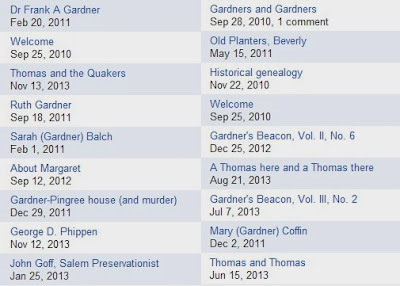 4 of Gardner's Beacon for a look at the first generation of Thomas' descendants. 01/05/2014 -- anceSTORY Archives has a recent article on treatment of the Quakers.The image comes from an article written by Melissa Berry for the Newburyport News. One might title this, Puritan entertainment. No, they did not allow the usual pleasures; rather, inhuman (and inhumane) activities seemed to be their attraction. ... One thing that we can be strongly assured of [is this]: Thomas and his kin were not of those who tied women (in an unclad state or otherwise) to carts and dragged them through the streets (er, muddy cowpaths).